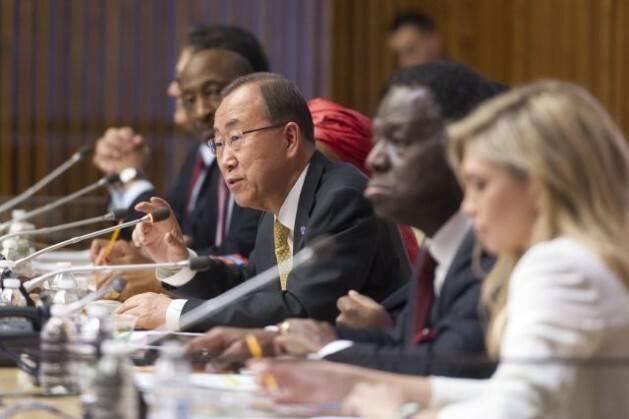 UNITED NATIONS, May 15 2015 (IPS) - Leaders from over 30 countries have come together for a two-day retreat May 14 and 15 at U.N. headquarters to reinforce their commitments to improve the health of women, children and adolescents around the world. Government delegates, CEOs, civil society leaders, private sector partners, global advocates and U.N. agencies are meeting to respond to U.N. Secretary-General Ban Ki-moon’s call for action for the U.N. Every Woman Every Child global movement, ahead of the U.N. Summit to Adopt the Post-2015 Development Agenda held in September. The group’s goal is to come up with new strategies and mobilise action to support women, children and adolescent health, including them in the Sustainable Development Goals (SDGs) agenda. It is also an occasion to discuss the political support of world leaders for the updated version of the Global Strategy for Women’s, Children’s and Adolescents’ Health, the new roadmap which will be launched at the U.N. General Assembly in September, with a draft five-year implementation plan, in order to end all preventable deaths of women, children, and adolescents by 2030 and improving their overall health and well-being. The Every Woman Every Child movement put into action the original Global Strategy for Women’s, Children’s and Adolescents’ Health roadmap on how to enhance financing, strengthen policy and services for vulnerable women and children. In March 2015, the movement published a Progress Report on the lessosn learnt from promoting a Global Strategy, and highlighting the key principles for the next version of the Global Strategy for the 2016-2030 SDGs. Since its creation in 2010, Every Woman Every Child has been the fastest growing international movement in the history of public health, with 400 commitments to improve health of women and children around the world made by 300 partners, underlined Ban. According to the movement, some 34 billion dollars in resources has been disbursed, translating into concrete action on the ground such as prevention of mother-to-child HIV transmission, access to oral rehydration therapy, improved maternal, prenatal postnatal care and vaccinations. The renewed Global Strategy movement will place new attention on young people’s needs and inequalities, improving health systems and services worldwide, and on new effective ways to respond to humanitarian crises, said Ban. “By investing in the potential of women, children and adolescents today, and over the next 15 years, we can save a generation within a generation – and benefit generations to come. But the opportunity and responsibility to act belongs to our generation, now,” Ban concluded.